The United Sounds of Los Angeles is a biweekly series from music writer Matthew Duersten that delves into the most underappreciated, obscure, and indispensable L.A. albums. There are countless ways to listen to the city; here are 100 of them. If Linda Ronstadt was the golden girl of L.A.’s rock scene in the 1970s—basically, the one everyone wanted to hook up with—then Jackson Browne was her male doppelganger. By his 20th birthday, the baby-faced songwriter had already been linked romantically to chanteuses Nico, Joni Mitchell, and Laura Nyro; by age 23, he had three critically acclaimed solo albums, a couple of radio hits (“Doctor My Eyes,” “Rock Me on the Water”), and stars like Ronstadt, The Eagles, The Byrds, and Joan Baez clamoring to record his songs. Hence the comedown. A Zen twilight-sleep of mortality and regeneration, The Pretender is like a rock and roll version of Joan Didion’s The Year of Magical Thinking. Nobody but Browne could make the apocalypse so personal, yet the lyrics are cryptic enough to carry more universal precepts. According to Browne, the elegiac piano ballad “Sleep’s Dark and Silent Gate” is the only song on the album to be directly influenced by Major’s suicide. (The hit single “Here Come Those Tears Again” was co-written with Nancy Farnsworth, Major’s mother, before the album was recorded.) Even more poignant are the twin reflections on fatherhood: In “The Only Child,” Browne speaks to his own son (“And remember to be kind/When the pain of another will serve you to remind”) while addressing his own distant father in “Daddy’s Tune” (“I don’t know why it was so hard to talk to you/I guess my anger pulled me through”). “Despair was ubiquitous in Los Angeles in 1976,” wrote Barney Hoskyns in his book Hotel California. From the ominous opening chords of “The Fuse” to the closing prayer for “The Pretender,” Browne evokes the burnt-orange haze of Los Angeles at dusk, when the sun has gone but the sky is still lit up like a kiln and the hills morph into giant dark shoulders. 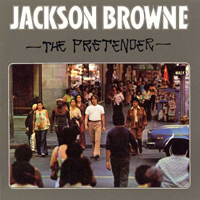 The album design underscores L.A.’s contradictions: The front cover shows Browne on a downtown street (it looks like Broadway), his spotless white tee the only thing distinguishing him from the gritty frieze around him; the back cover shows Browne’s son Ethan frolicking innocently in the Pacific surf, framed by a translation of Pablo Neruda’s “Brown and Agile Child.” Like all of Browne’s albums from this period, the guest musicians are a who’s who of denim-clad, countrified Cali rock: J.D. Souther, David Crosby, Bonnie Raitt, Graham Nash, David Lindley, Don Henley, Lowell George. Apparently, The Pretender resonated with Jerry Ford’s America, reaching #5 on the Billboard album chart and spawning a couple of moderate radio hits. Although many critics consider it Browne’s masterpiece, a few derided producer Jon Landau for drowning the power of its lyrics in uninspired, factory-precision yacht rock. (Yes, a future member of Toto plays on this record.) Still, one can hear this album’s DNA in the music of Ryan Adams, Wilco, Lucinda Williams, and Dawes. Tabloidy footnote: In 1994, Joni Mitchell revived old wounds with her acidic song “Not To Blame,” reportedly a takedown of her ex-paramour that included what listeners thought were bitter references to Major and their son Ethan (“His mother had the frailty you despise/And the looks you love to drive to suicide”). Mitchell later denied these claims. “Linda Paloma” – A lovely detour into Mexican music, thanks in part to Roberto Gutierrez’s willowy guitarrón, this song was purportedly based on a ballad played by mariachis at Browne and Major’s favorite Mexican restaurant.